Our slowly developing spring is a real boon to us procrastinators. If you exercise caution by performing a close inspection of what lies beneath, there may still be time to make a non-selective herbicide application to control Poison Hemlock (Conium maculatum) without wiping out preferred plants that have not yet sprung for spring. Poison hemlock is certainly a worthy target for early spring herbicide applications. It's one of the deadliest plants in North America. You don't want this nefarious non-native invasive weed flourishing in landscapes where people; particularly children, can come into contact with the sap, seeds, foliage, or roots. It's no exaggeration to say the outcome could be lethal; consider Socrates. The plant contains highly toxic piperidine alkaloid compounds, including coniine and gamma-coniceine, which cause respiratory failure and death in mammals. Indeed, the infamous demise of Socrates is testament to the lethality of poison hemlock. Plants and seed were imported to North America as an ornamental from Europe and West Asia in the late 1800s. Unfortunately, this dangerously toxic plant is now common throughout much of Ohio. The toxins must be ingested or enter through the eyes or nasal passages to induce poisoning; they do not cause skin rashes or blistering. Regardless, this plant should not be handled because sap on the skin can be rubbed into the eyes or accidently ingested while handling food. While the roots are more toxic than the leaves and stems, all parts of the plant including the seeds should be considered dangerous. Poison Hemlock belongs to the carrot family, Apiaceae (formerly Umbelliferae). It shares a number of characteristics with the non-native but non-toxic Queen Anne's Lace (Daucus carota) as well as the non-native Wild Parsnip (Pastinaca sativa) which is notorious for producing sap that causes skin blisters through phytophotodermatitis. Poison hemlock has a biennial life cycle and spends its first year as a basal rosette; the stage that is currently very apparent. During its second year, plants produce erect, towering stalks and multi-branched stems topped with umbrella-like flowers. Mature plants can measure 6-10' tall. 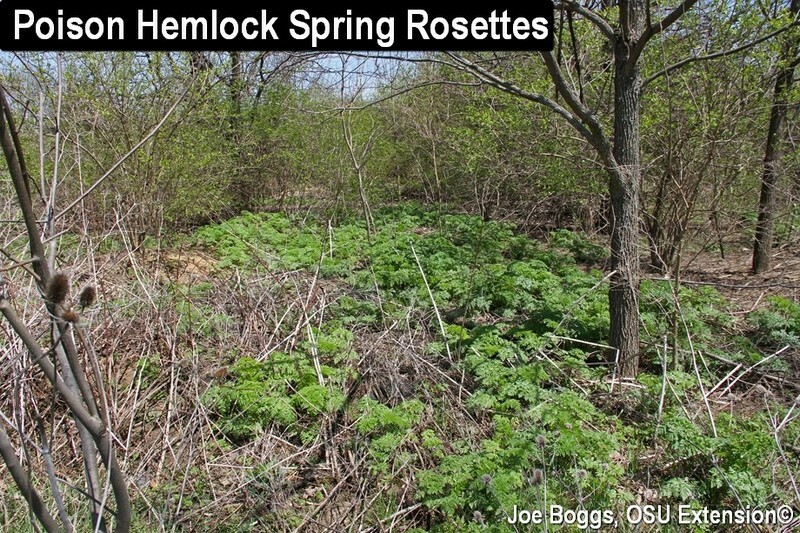 Poison hemlock can be managed by mowing and tilling; however, the most effective control and perhaps safest relative to avoiding the sap focuses on properly timed herbicide applications. Non-selective herbicides, such as glyphosate (e.g. Roundup) or pelargonic acid (e.g. Scythe), applied now can eliminate the first season rosette stage and the second season flowering stage, before seeds are produced. Selective herbicides, such as triclopyr (e.g. Triclopyr 4, Ortho Poison Ivy and Trough Brush Killer) or clorpyralid (e.g.Transline), may also be applied now, but are generally more effective once plants start initiating the flower stalks. Of course, as always, you must read and follow the label directions when using any herbicide to maximize safety and product efficacy.